On the Tassajara valley floor looking up at some of the surrounding cliffs and ridges. Note the tiny cabin in the upper left. Noun – a slender shoot of a tree or other plant; a small offshoot from a branch or stem. Anatomy – one of the minute branches of a blood vessel or nerve. Verb – to look at, observe, perceive, or understand, as in Do you twig the connections? As with the natural environment that cradles it, Tassajara has gone through many changes, some gradual, some abrupt. For over a thousand years it was used by the indigenous Esselen tribe. The creek and hot springs, located in a deep ravine of remote central California coastal mountains, are named after a permutation of the Esselen word for “place to hang drying meat” (ironic given it is now occupied by vegetarians, but maybe still applicable to the naked bodies sprawled out on the the decks, fresh from the baths!). Between the late 1800s and early 1960s, it went through various lives as a resort with a stone hotel and wooden cabins centered around the healing waters. Early cars had to chain large trees to their rear axles to slow their descent down the steep, rugged dirt road; even today it takes over an hour to drive the 14 miles down into the canyon. In 1967, Suzuki Roshi and the San Francisco Zen Center bought the land and established the first Zen monastery outside of Asia. Between September and April it is a place for students to study Zen but during the summer it opens up to anyone interested in taking workshops, meditating, or just enjoying the hot springs, native plants and wildlife, wonderful food, and the blissful quiet of escaping the grid for a few days. 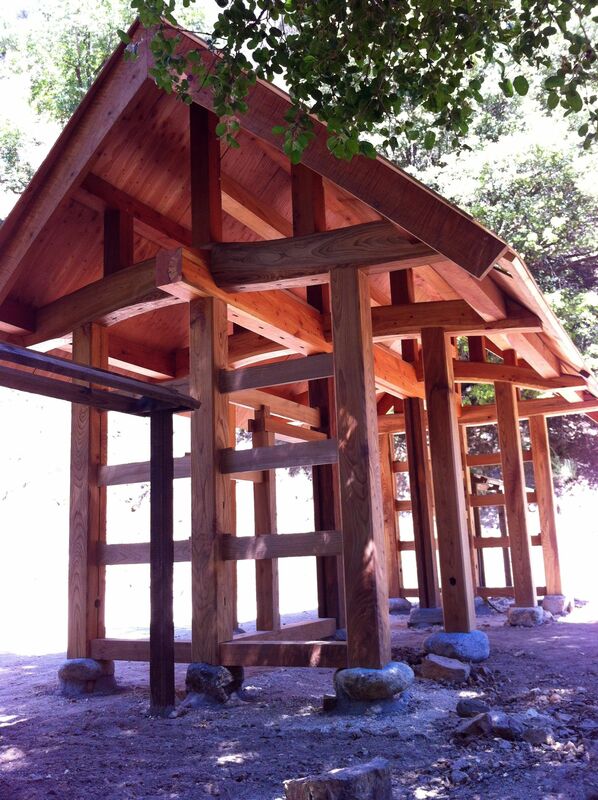 When I was last there in May 2013, the gate had been framed using special Japanese joinery techniques, supported by Tassajara river rocks. 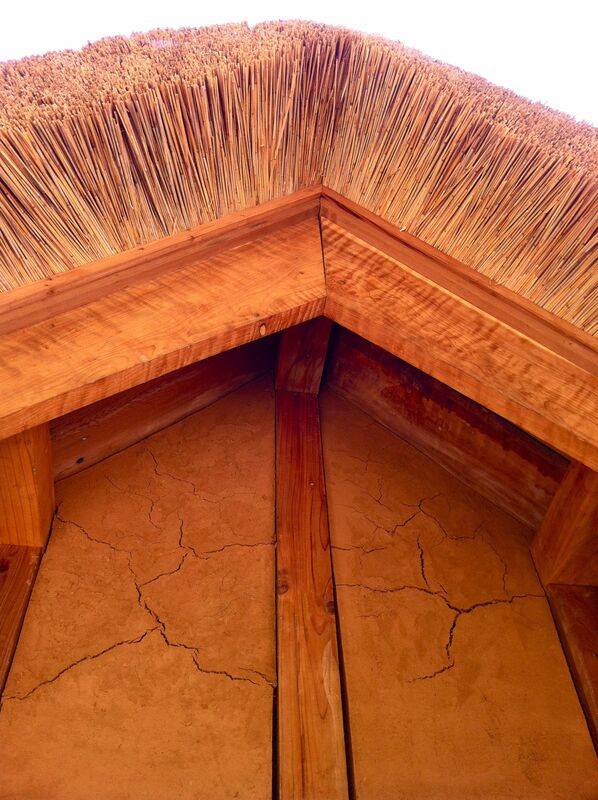 Now it is finished with mud walls and a thatch roof. 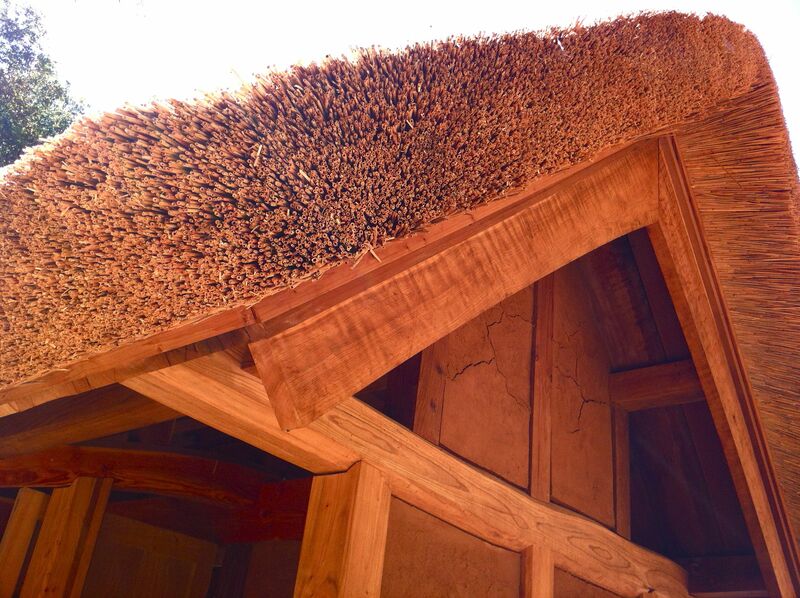 I love how wonderfully natural and tactile the thatch roof is! 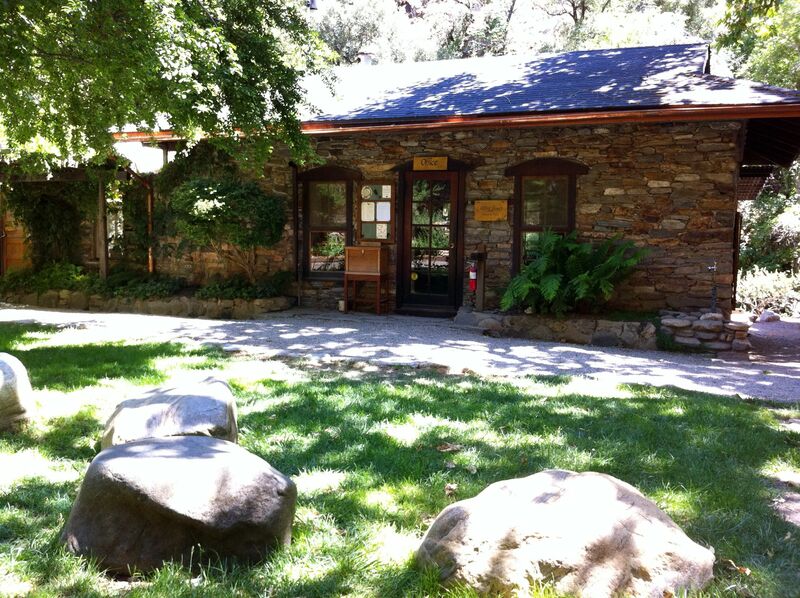 I’ve been coming to Tassajara for over 20 years. It’s a chance to deeply unwind and take stock, to reflect on what has changed within me and in my life since my last visit – and what stays doggedly persistent. And though it’s catering to a more well-heeled crowd than it used to and I may be priced out at some point, it serves as an important touchstone for me, especially now as I’m contemplating my “retirement” and next phase of my life, moving back to Oregon, and completing my tiny house. Tassajara has a mix of architectural styles reflecting the transformations and changing occupants over time. The large stone buildings anchor the center, housing the office, kitchen, and dining rooms, as well as the high-end guest rooms. 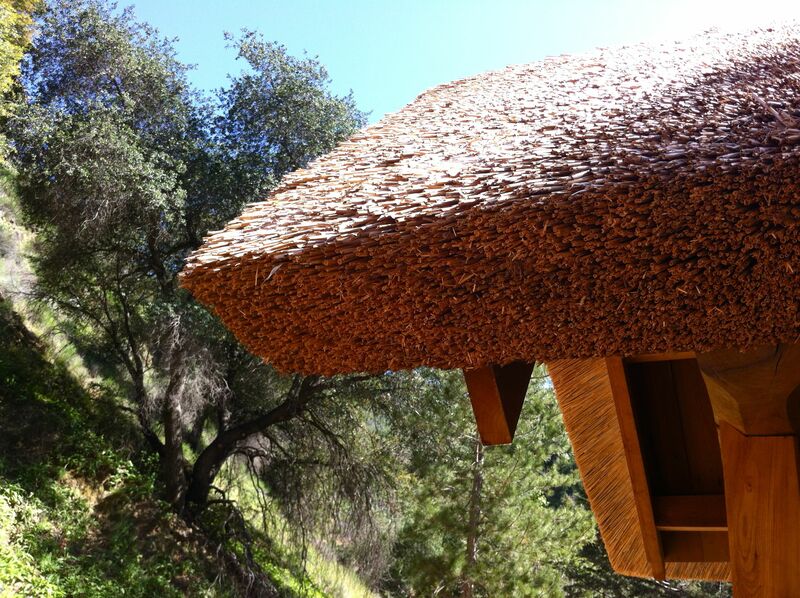 Tassajara office and bookstore made of local river rock, Western red cedar, and copper. You can’t help but be affected by the designs throughout Tassajara. While the styles of the buildings differ, they all share this simplicity, a purity of craft (the older cabins are more raw and simply made), and an integration of local natural materials and history, resulting in a feeling of peacefulness. This has strongly influenced my own design decisions for my tiny house (see my posts on Designing Sparefully, On Plumbing, Meditation and Healthful Hearts, and The Introvert and the Tiny House), though I don’t think I fully appreciated just how much until this trip. The tiny redwood cabin (with a big twig) I stayed in this trip. You leave your shoes outside, partly to prevent tracking in dirt but also because it establishes a sense of mindfulness, a practice borrowed from Japanese temples. 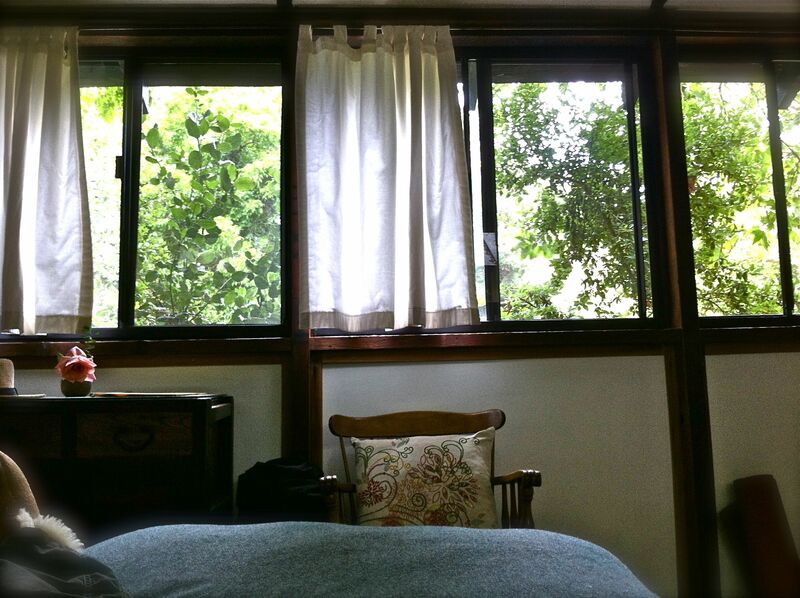 In the past, the tatami and redwood cabins where I’ve stayed have just been a natural place to lay my head and relax between meals, trips to the baths, and hikes. I liked their rustic simplicity since they reminded me of my childhood cabin, but I didn’t think too much about their form or design. Last year, my visit to Tassajara followed months of researching tiny house designs; a momentary respite before I started construction. Looking around with my new world view, I realized the cabins were essentially tiny houses and I began to look at them more closely. I knew I wanted to incorporate what I loved about Tassajara into my design but I hadn’t fully articulated what I now call “designing viscerally” and I wasn’t sure if it would feel the same in a different context. I didn’t know about Degenhardt’s spiritual design ideas at the time other than what I intuitively felt while in her buildings. I’m still trying to pin down what the actual elements are that embody that feeling. 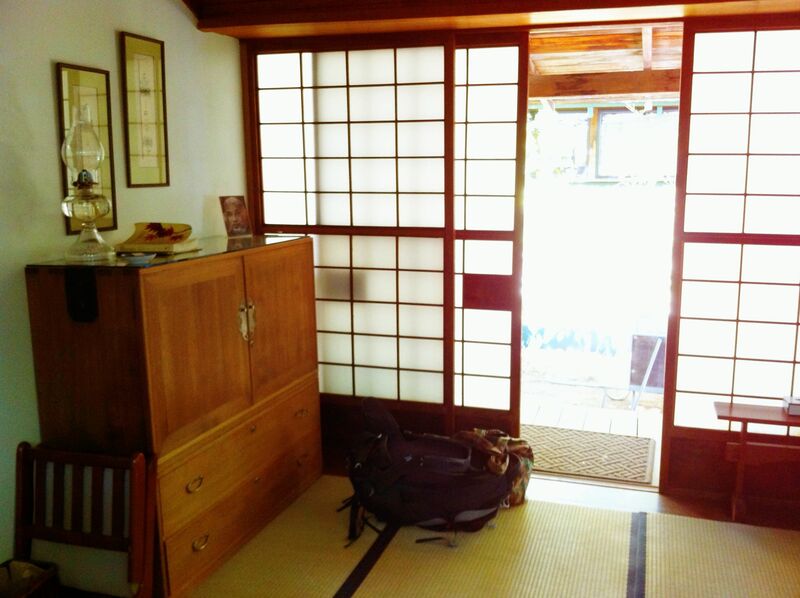 This is from last year’s tatami cabin with its mats, rice paper sliding doors and mattresses on the floor. 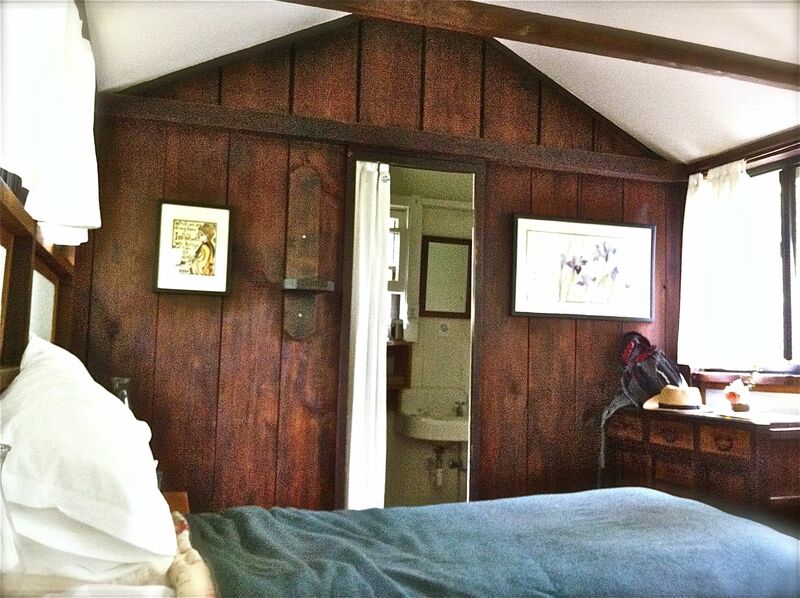 Lovely, but a very different feel from the redwood cabin as you’ll see below. Despite this, they share a similar feeling. This time, maybe because I was in a down-to-earth redwood cabin instead of my usual more exotic tatami cabin, it really hit home. Or rather, I felt like I was home. As soon as I walked in, I felt like I was walking into my tiny house. I had the same leap of my heart and big smile I experience each time I return for another building stint. Partly this was the similar dimensions and somewhat similar floorplan, but it was more than that. It wasn’t the aesthetics, since the wall treatment wasn’t necessarily what I would choose and isn’t what is in my unfinished house now. Yet still there was a strong sense of familiarity and peacefulness. I’m not quite sure what to attribute it to (but suspect it has to do with proportions, the gable roof, a conscious balance of windows and walls, and the use of wood), but happily I think I somehow managed to capture some of that spiritual design – that clarity – in my house. The redwood cabin has more of a familiar Western feel with the raised beds and wooden door. 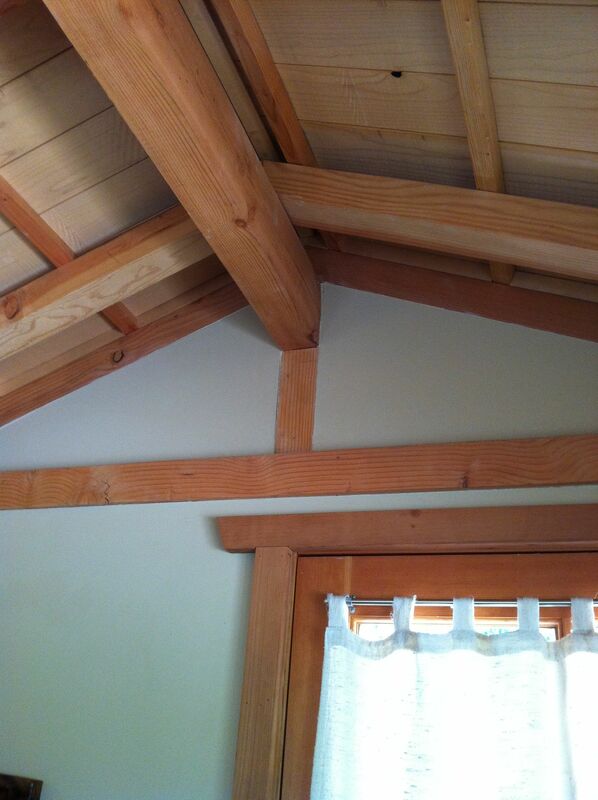 The dimensions are 10′ x 16′, similar to my 8.5′ x 16′ house but without the loft. 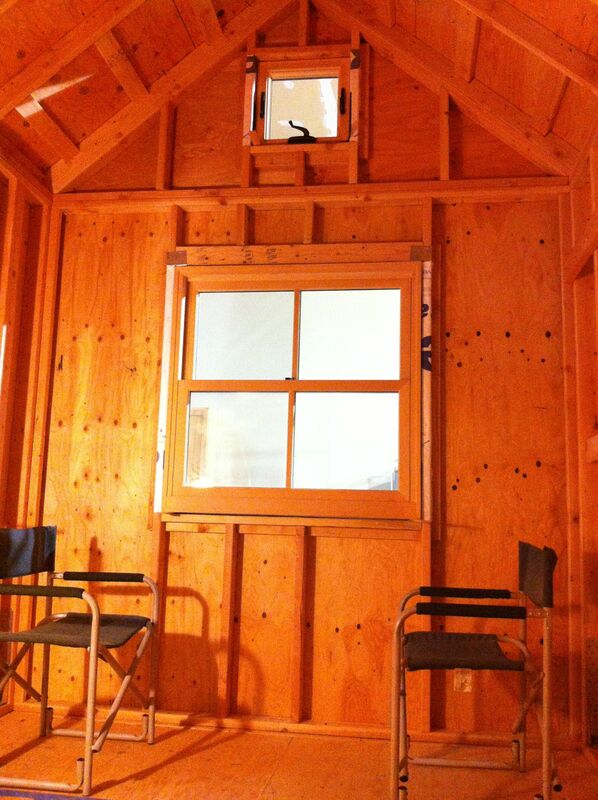 There are windows nearly the entire way around, giving it a very open, airy feeling. 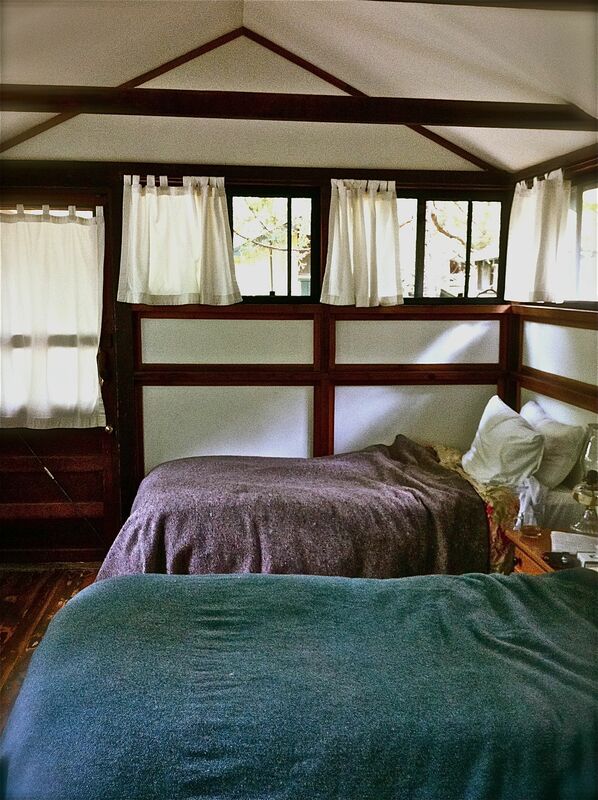 I laid on the bed with the windows open and watched the leaves blow in the wind, the shifting patterns of light and shadow, and listened to the burble of the creek, the squawk of the steller’s jays, the rumble of a handcart down the path. When it got dark, I lit the kerosene lamps. In some undefinable way, this simple cabin felt more physically like home to me than any of the multitude of houses I’ve lived in over the last 50 years (if you separate out what family brings to a sense of home). I guess it’s no surprise that tiny houses resonated with me from the start. Last year I discovered a new restroom that I completely cottoned to due to its tiny house similarities and an aesthetic I liked (the last one had burned in the wildfire that nearly destroyed Tassajara). Even this trip, I found myself going out of my way to visit it since it stilled smelled of fresh-sawn pine and made me homesick (in a good way) for my tiny house. Not sure what Proust would have to say about my visits to the toilet! 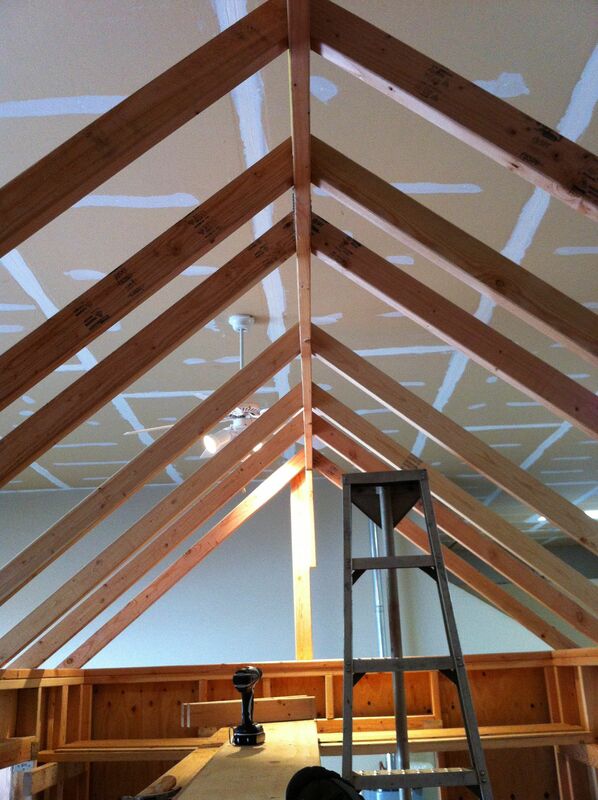 Note the interesting way they did the rafters and roof sheathing. My morning routine of the last few days has been to wake up before dawn as the bells summon the monks to meditate, walk along the stream to the baths to soak out the aches where my aging bones meet the firm mattress, grab a cup of coffee and settle into my hidden chair under the huge walnut tree. The rocky cliff rises above me, dotted with spiky century plants, Indian paintbrush, and sticky monkey flower. One morning a deep, fast-moving vibration signaled a hummingbird zipping by to perch on a leafless branch at the top of the cliff, a tiny silhouette in the rising sun. A canyon wren trilled and a yellow and red tanager flashed past. The smell of dust and wild sage drifted down, mingling with the more cultivated aromas of flowers and herbs in the gardens below me. I felt like I was straddling the two worlds, much like my impending life-changing move from California to Oregon. A lot of this trip was spent trying to grapple with all of the uncertainties around this big event. 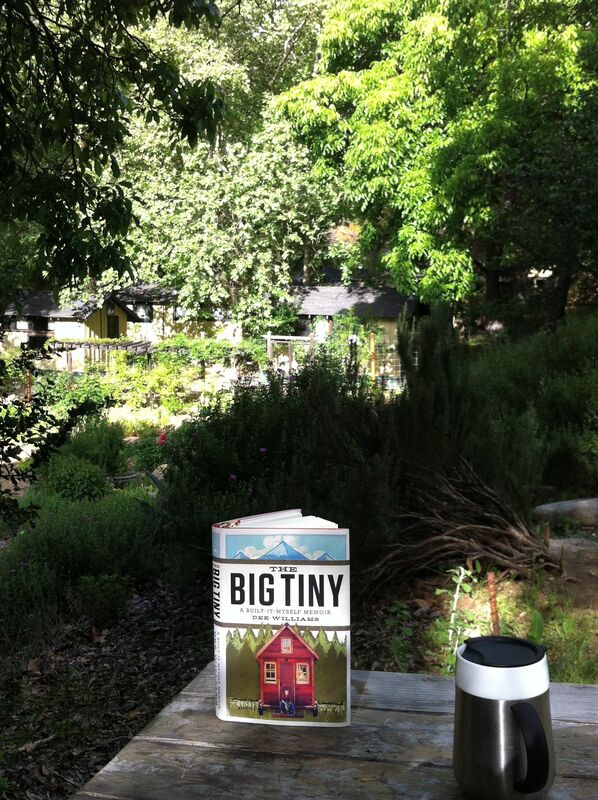 The week before, on Earth Day appropriately enough, Dee Williams launched her new book, The Big Tiny. She’d swung through the Bay Area on her book tour and it was great to catch up and hear her speak. Later, perched beneath the walnut tree in my precarious state of mind, Dee’s book was just what I needed. The monastery cat stopped by to say hello. If you look closely, you can just see my morning chair beneath the arbor, starting up the cliff. 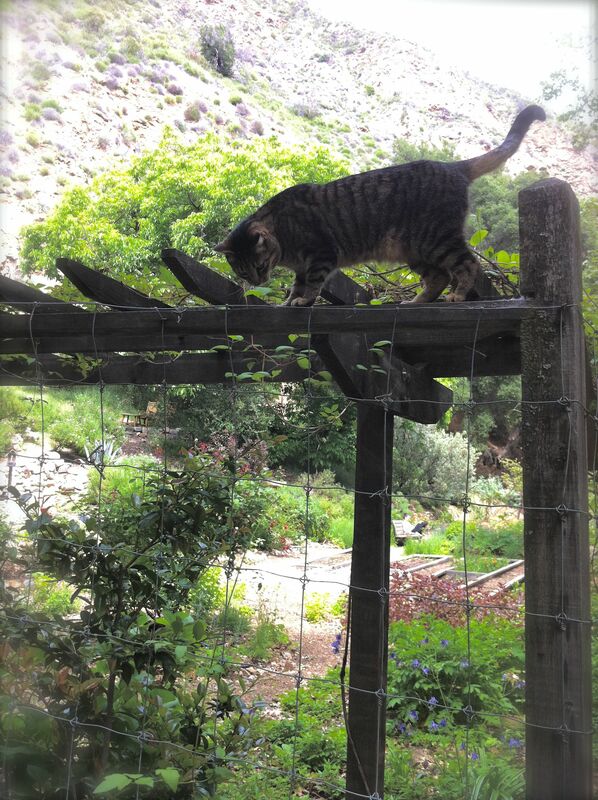 The Big Tiny visits Tassajara. Looking down on the gardens and cabins from my perch. It’s the story of how the sudden onset of her heart condition in her 40s led to a re-evaluation of everything in her life, and ultimately to the decision to build a tiny house, long before the modern ‘tiny house movement’ and before easy access to the internet and youtube how-to videos. But really it is about finding her place in the world, a deepening sense of connectedness to the community and the natural world around her. Funny and irreverent, it’s also deeply moving and definitely puts things in perspective. I thought I’d find something in all of this, and I got more than I bargained for. I discovered a new way of looking at the sky, the winter rain, the neighbors, and myself; and a different way of spending my time. Most important, I stumbled into a new sort of ‘happiness,’ one that didn’t hinge on always getting what I want, but rather, on wanting what I have. It’s the kind of happiness that isn’t tied so tightly to being comfortable (or having money and property), but instead is linked to a deeper sense of satisfaction – to a sense of humility and gratitude, and a better understanding of who I am in my heart. …I found a certain bigness in my little house – a sense of largeness, freedom, and happiness that comes when you see there’s no place else you’d rather be. Her message of less is more and living sustainably felt very in keeping with Tassajara (and was validated by the woman who orders the books for the bookstore when I mentioned it to her!). The search for clarity and mindfulness goes hand in hand with those wanting to live more intentionally, whether they practice Zen or not, whether they live in tiny houses or not. Through her workshops and help, Dee has been an inspiring mentor for me from the beginning. Walking into the tiny houses she’s designed, I get that same feeling I do at Tassajara. But it’s also how she lives her life. Reading her story underlined how you can never know what is around the next corner. Do your homework, be safe, but sometimes you just have to floor it when you come to the overpass with your tiny house in tow. The Big Tiny echoes the words of poet Mary Oliver: “Tell me, what is it you plan to do with your one wild and precious life?” A question we should all be asking ourselves, constantly. And harking back to twigs, it’s easy to picture the tiny house movement as a series of slender branching offshoots, all inter-related in one growing, vibrating entity. 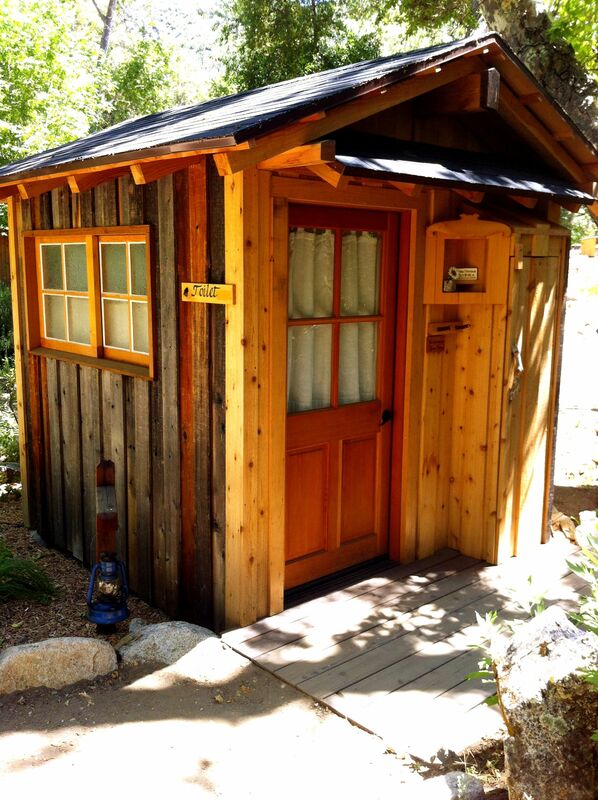 Just as Dee’s story grew out of her experiences with those who have lived tiny before her, her wise words and wisecracks are helping guide others as we grow our own little twig on the tiny house story tree. It’s really pretty awesome when you step back and see the connections stretching around the world. As I sat in the garden reading Dee’s book and thinking big thoughts about tiny things, and tiny thoughts about big things, I heard a loud slap of feathers as a band-tailed pigeon nearly the size of a chicken landed on a branch above me, bending it down. I soon forgot about it but then heard it again. At first I thought there were two up there but then realized it was the same pigeon doing a lot of coming and going. When I saw it arrive with a stick in its beak, I twigged what was going on (heh). As I watched it fly off across the ravine, I wondered why it didn’t look for nest materials closer to home; there seemed to be plenty around. Maybe it wanted to create distance, to draw attention away from where its nest will be – under the radar, separate from the rest of its life, a safe sanctuary. Or maybe it requires a certain kind of twig from a certain kind of tree, like I had driven an hour and a half to try to find a particular kind of siding for my house. Or perhaps it’s reusing twigs from an old nest, salvaging materials, and moving locations to get a new perspective on life. I can relate. 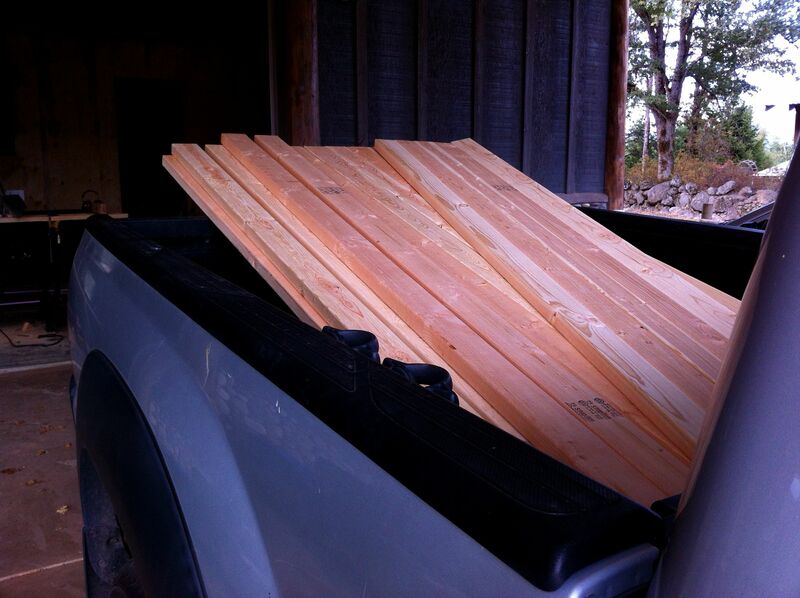 A year ago, as I sat in the same chair at Tassajara, I was thinking about my impending build. 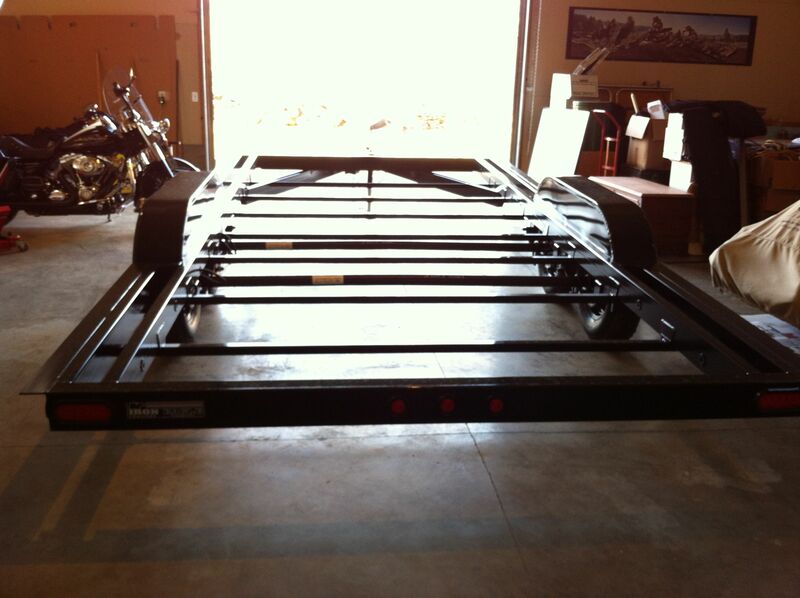 I’d already purchased my trailer and moved it to my parents’ barn so I was committed. I was frantically trying to finish my designs since I was due to leave in a couple weeks. I had a lot of trepidation about the whole thing. The beginnings of Naj Haus. The quasi-contemporary look was an accident, which I like, but I’m also looking forward to seeing it grow weathered and aged, to see its character come out. I’ve learned an incredible amount – not only about building but about myself. It’s been an intense but good year and I have to stop and remind myself of the progress when I get frustrated with how slowly it’s going (and truthfully, I’m very happy with how it’s turning out). I’m learning to be patient, that things have a natural course of unfurling that can’t be rushed. You should do this whether it involves a tiny house or not, but if you are building a tiny house, don’t commit until you are so obsessed you can’t imagine life if you don’t build it. Unless you’re an experienced carpenter, building a house might just be the hardest thing you do and you have to really want it to get through the rough patches. 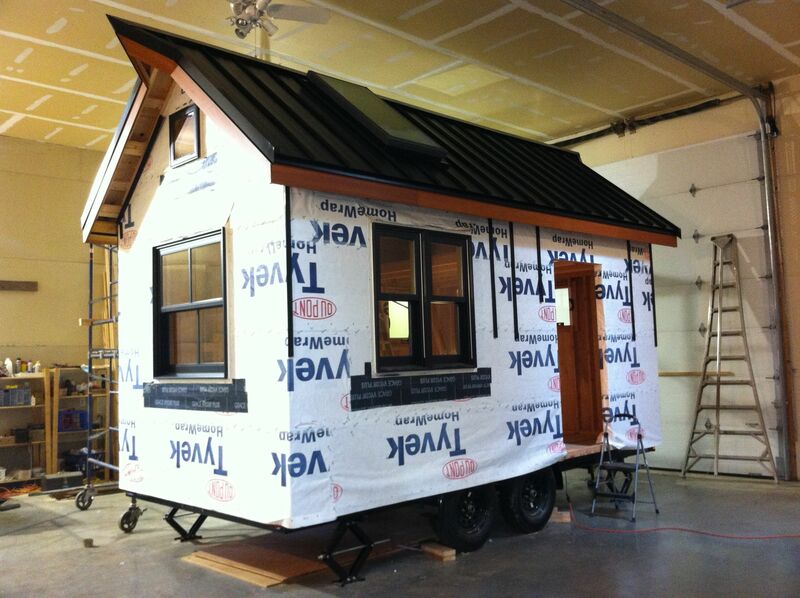 That said, building a tiny house is a wonderful thing to be passionate about! Pay attention to function and form as you design your house, but really pay attention to how every element makes you feel. We have unconscious, visceral reactions (positive and negative) to colors, proportions or lack thereof, heights, etc., that tap deep into our primitive limbic centers in our brains. What works for one person might not work for you (even if it’s the hot new thing on the tiny house blogs), so you have to practice really tuning in to the spaces around you. This will make your house unique to you, and can make or break whether you can be happy in a tiny house long-term. See more about this here. To really test out your visceral reactions, spend the night in a tiny house, or at least visit one and have time to hang out in it. 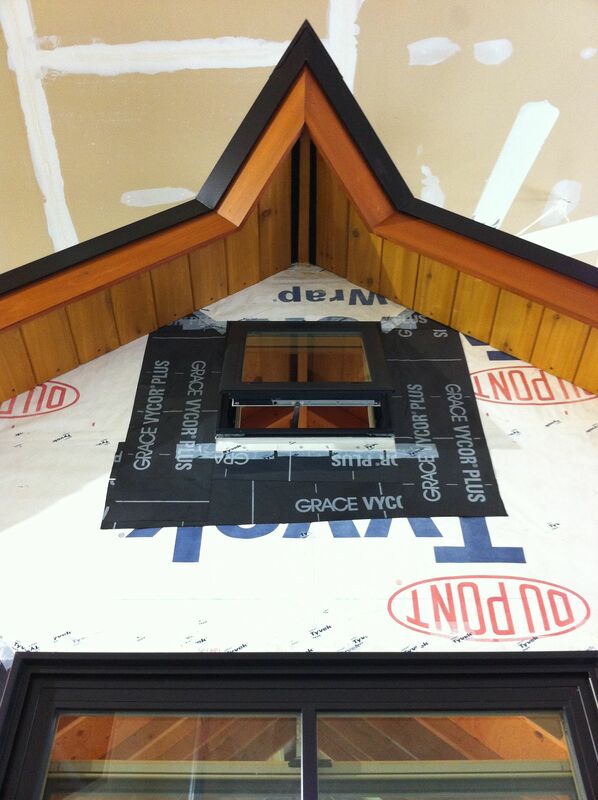 If you have a strong adverse reaction, figure out if it’s something you could design differently in your own house. If it’s feasible, moving into a small apartment can teach you a lot about what you can live with and what you can’t, and also helps you with the downsizing process and learning to live tiny. Do your research and really understand building science and safety issues. As issues come up, you’ll need to make decisions and you need to know about things like a) the inter-relations between moisture control, insulation, rainscreens and the roof so you won’t get mold, b) framing and tie-down principles so you maintain structural integrity on and off the road, c) safe wiring, plumbing and propane installation, and d) means of escaping from a fire. Hire parts out that are high risk if you don’t feel confident, or have a certified inspector double-check your work. Be safe. See my Resources page for workshops, books and consultants I’ve relied on extensively. Even if you purchase designs, you need to really own them – that is, know them inside and out. It’s a good idea to build a 3D model stick by stick so you can understand how it all fits together and how the build will go. It will help you locate questions and problem areas you can research in advance. Inevitably you will make changes on the fly as you are building and you need to know how that could affect other parts down the line. 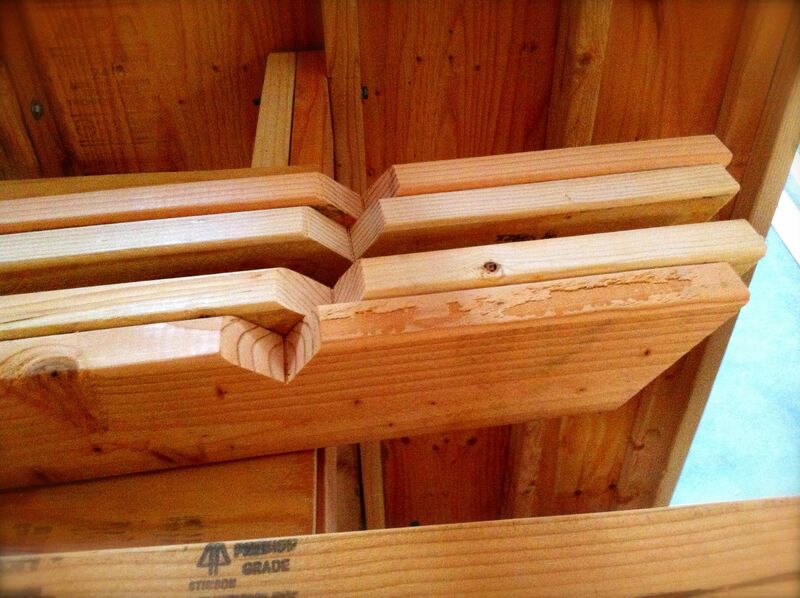 For instance, if you shift a stud, will that throw off how your sheathing will line up? Here are some resources for learning to use SketchUp, a free 3D software program. Make sure you’ve got some patient soul you can turn to with questions because you will have more than you know what to do with. Ideally they can help you with the actual building so you can learn technique and proper tool use (or try to get some building experience ahead of time). If possible, find a few mentors so you can spread out your pestering. Don’t be afraid to pick people’s brains at the hardware and lumber stores. Know who is good for what, how you (and they) react under stress, and whose energy you want around you and your house. Be gracious – they’re doing you a huge favor. Seen on the internet. Source unknown. Ha – not that kind! If at all possible, try to find a location where you can build inside and lock up your tools. People build tiny houses outside all the time but it definitely adds effort and worry around protecting against weather damage until you get it dried in. The last thing you want is moldy, warped sheathing. It’s also nice if you don’t have to schlep your tools back and forth to a secure location every time you want to build. However, if cost is an issue, there are definitely ways to make an uncovered site work. Be sensitive to your neighbors’ noise tolerance levels. Deadlines can be good motivators, and it’s good to set interim goals, but be careful about locking yourself into them – it adds a lot more stress. Set realistic expectations for how long your build, or certain phases, will take, accounting for things not going quite the way you planned (hint: it is almost guaranteed to take longer than you think!). When you’re pressed for time, you will be tempted to take shortcuts and that will almost always come back to bite you. Building is a long, arduous process and you need to take care of your mental and physical well-being. Stretch. Meditate. Don’t push yourself too hard. 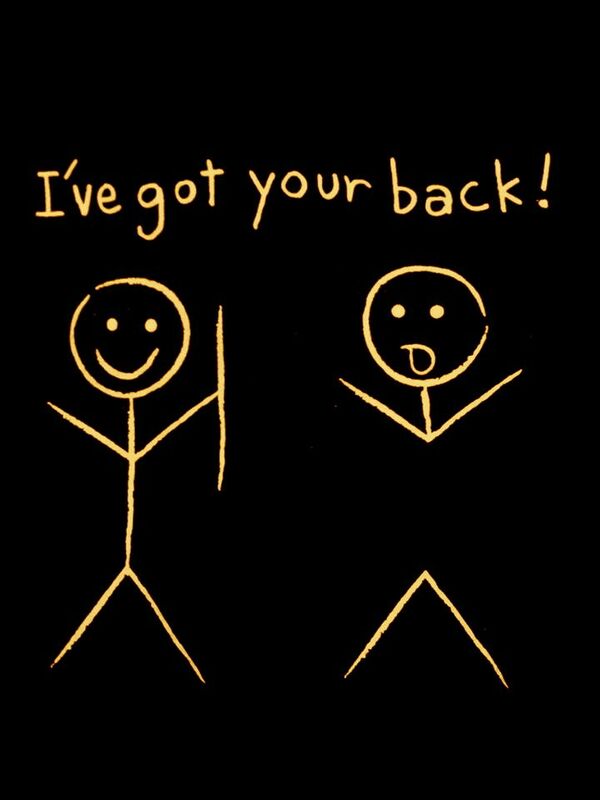 Call on help when you need it, even if it’s just to share a laugh. Don’t work when you’re tired. Give yourself time to recover. Be mindful. Lift properly. Take holidays completely away from your house once in a while. Be sure to take time to review what you’re doing and what you’ve accomplished. Spend some time at the beginning and end of each build day just sitting with your house. Acknowledge your progress. Be open to making changes on the fly. Use this experience to become more self-aware and to figure out your relationship in community. It’s pretty dang powerful. Life-changing, in fact – don’t let the lessons slip by. Keep a blog or a construction journal. 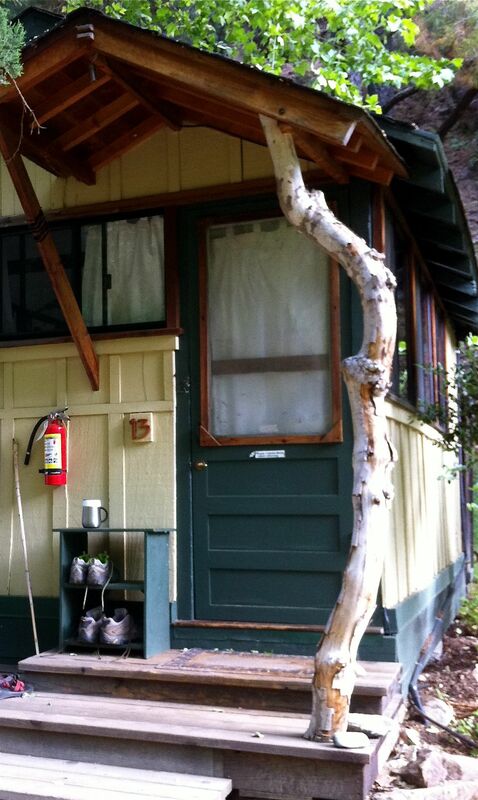 Share your experience, your twig on the tiny house story tree. The hot plunge at Tassajara is deep and lined with light blue tiles. There’s a submerged tiled bench around three sides where you can sit half in and half out of the water. The high walls are bleached stucco and earthy, rising up to small windows at the top, mission-like, beneath the beamed ceiling. There are sliding wood and glass doors that open directly out onto the decks on one side and down to the stream on the other. I spend a lot of time soaking until I’m so hot that the walk down the riverstone steps to dip in the ice cold creek feels cathartic. And then back to do it again until every muscle and nerve and thought relaxes and stills. Until I get to that point, there is a lot of mind-racing still going on. Pondering what will come next for me. Looking at the surface of the plunge, I see the tiles below. But then I realize I’m also looking at a reflection of the trees and steep hillside on the other side of the stream. I think about perspective and the importance of being still and paying attention to what’s around me. But nature is also about change, about unfurling and growing and decaying. Rocks shift and come to rest, then shift again. The stream continues to flow, finding a new course when a rockslide blocks its way. Fire races through, charring the trees and clearing the understory to allow a riot of wildflowers to rise up and start the cycle of succession again. When we think of what nature looks like, it’s a momentary snapshot of these transformations in action. The bud about to bloom, the lacy filagree of a decomposing leaf, the crack in a smooth stone, the pattern of rust on iron, feathers of frost. The Japanese call this wabi sabi, finding beauty in aging, appreciating the imperfections and unexpected temporary happenstances. When it’s used in architecture by incorporating natural materials – live edge wood, stone walls, rusting metal – it’s a reminder of nature taking its course, coming into its own, finding balance then breaking down to start a new cycle. 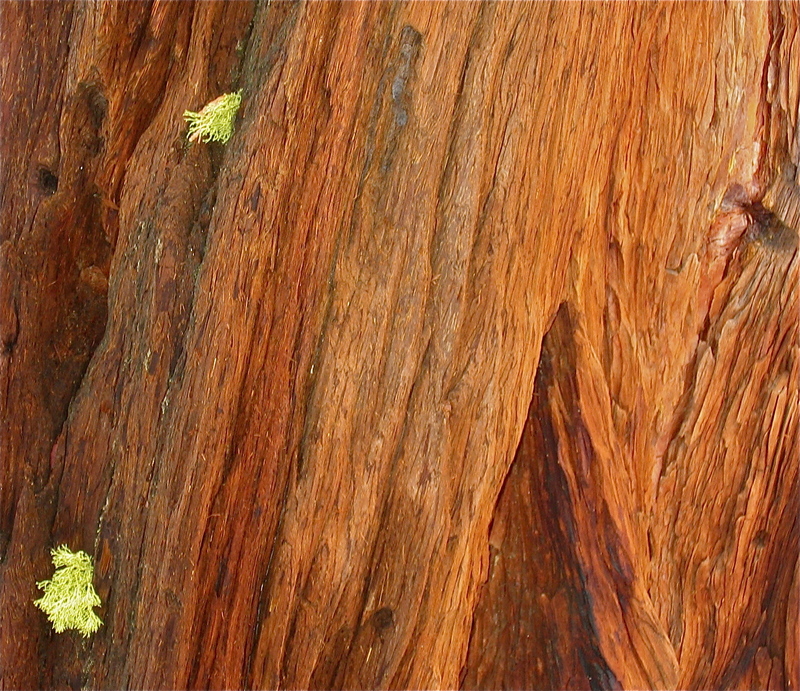 An ancient sequoia shedding its bark, Sierras. I see this too as I look around at the women in the baths, now unclothed, no longer hiding the stories of their bodies, the scars, the tattoos, the folds and creases. When I first walked up to the hot plunge, I was surprised to see a prosthetic leg lying at the top of the steps like a hollow reed, confusing since everyone in the baths had their legs accounted for. Later I realized that it belonged to the tiny slip of a woman perched on the bench like the hummingbird on the cliff. She must have been in her 80s at least, every inch of her papery skin dotted with age spots and creased with wrinkles. But her eyes were sharp and her quick smile belied a lively wit, not in the least bit diminished. She had a vitality I envied and there was great beauty in the grace of her aging. It is sad our culture is so quick to hide our bodies after the first bloom of youth wears off. It interrupts our sense of belonging to a greater transformational process. So these were the things I thought about at Tassajara: twigs and how they sprout, unfurl, intertwine and grow the tree, or snapping off to be tucked into nests to raise chicks, or falling on the ground in layers of loamy soil to fertilize new growth. About layers of architecture covering and revealing the changing inhabitants, history rubbing through like a palimpsest. The natural and unstoppable progression of rocks and water and blossoms and bodies to come into their own. About connectedness and friendship and family and maybe the Buddhists have it right that our egos aren’t really that important (as scary as that used to seem to me), that we’re all part of the same existence that ebbs and flows. About designing peacefulness. About stillness, but also about moving forward, to grow, to create, to find the courage to follow your passion, that thing that feeds your heart, as you plunge into the unknown. Wabi sabi – twig it? Kate thank you so much! 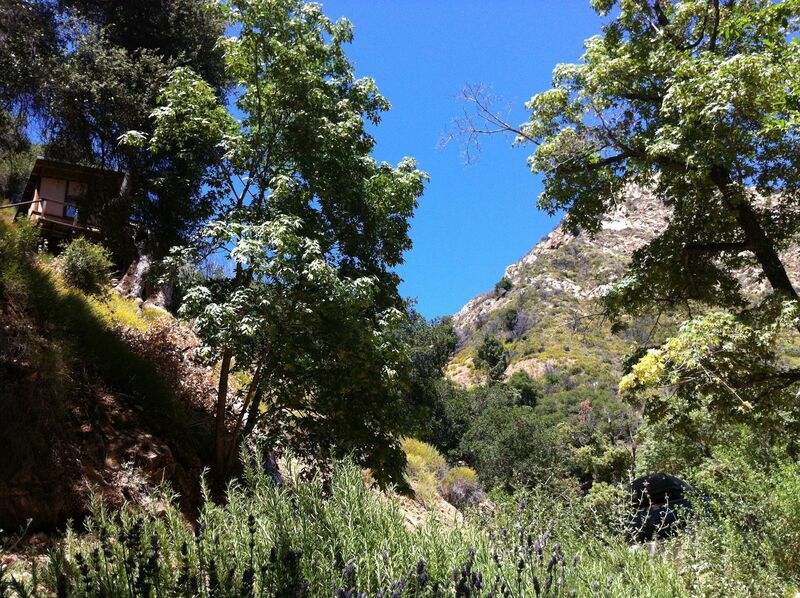 I just had a wonderful time revisiting Tassajara. You were able to articulate and to share your sense of time, place and beingness with such clarity. Your musings inspire and delight. Your mention of Wabi Sabi….it is the third time this month that it has been mentioned in my field of experiences. I am definitely being tapped on the shoulder…”wake up, wake up….time to explore in greater depth this idea of Wabi Sabi!” ….and so be it. Thanks, Nina! Was hoping to see you there. I’m sure you can relate with all your life changes too!